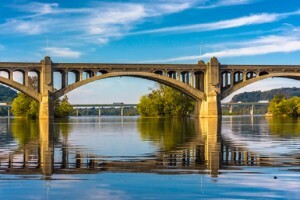 YORK, PA and VANCOUVER, BC – York City Council approved yesterday the construction of a facility at the York Wastewater Treatment Plant that will implement innovative new technology to recover phosphorus and other nutrients from wastewater and recycle them into a renewable and environmentally safe, premium-quality fertilizer. The new technology will be installed at the York Wastewater Treatment Plant that provides wastewater services for more than 75,000 residents in municipalities including York City, Spring Garden Township, North York Borough, West York Borough, West Manchester Township, Manchester Township, and York Township. The York Wastewater Treatment Plant has a design capacity of more than 26 million gallons of wastewater a day (MGD) and employs biological nutrient removal to meet the strict discharge limits required in the Chesapeake Bay watershed. In a unique public/private partnership, The City of York has commissioned Ostara Nutrient Recovery Technologies Inc. of Vancouver to construct a Nutrient Recycling Facility (employing the PEARLTM Process), and provide the service of removing polluting nutrients. The fertilizer by-product branded “Crystal Green®” will be sold by Ostara and the revenue generated will be shared with the City. This first-of-its-kind project will enable cities to achieve nutrient recycling – and meet environmental limits – through a fee-based model without incurring capital costs or technical risk. Developed by Ostara, the new technology will provide benefits to York, its ratepayers and the environment by increasing plant capacity and reducing maintenance costs, while also creating a revenue-generating by-product. It is expected that the facility will become fully operational in spring 2010. Steve Douglas, General Manager at the York Wastewater Treatment Plant, said that partnering with Ostara presents an environmental and cost-effective solution to an increasing challenge for wastewater treatment facilities. Ostara’s PEARL process integrates directly into the York treatment system, processes the sludge liquids, and then converts them into a high-quality environmentally safe fertilizer. During a pilot study, conducted in spring 2008, it was found that the PEARL process recovered more than 90 per cent of the phosphorus and 20 per cent of the nitrogen that would normally be returned back to the plant from the solids processing. Building the Ostara Nutrient Recycling Facility at the York Wastewater Treatment Plant will help protect the environmentally-sensitive Chesapeake Bay, and its rivers and streams. The discharge of nutrients, such as nitrogen and phosphorus, into Chesapeake Bay causes algae blooms that choke surrounding marine life and upsets the natural ecosystem. It has been identified by the Chesapeake Bay Foundation as one of the most serious problems affecting the Bay. Phillip Abrary, President of Ostara Nutrient Recovery Technologies, says the partnership with the City of York provides a solution for any wastewater treatment plant faced with struvite issues. Struvite is formed when phosphorus and other nutrients from the sludge handling processes become highly concentrated and coat pipes and valves, reducing flow capacities and increasing maintenance requirements. “This public – private partnership with Ostara and the City of York is a creative approach to helping wastewater treatment facilities deal with the operational and environmental implications associated with an overabundance of nutrients. Ostara provides a solution that is no-risk to the city from a financial or technical perspective. The City of York will start saving money as soon as the facility becomes operational,” says Abrary. Through the agreement, Ostara will construct a complete PEARL system with two reactors. The City of York will pay Ostara a monthly fee for the removal of nutrients and the ongoing operation and maintenance of the facility. The City of York and Ostara will share revenue from the commercial sale of Crystal Green which Ostara will take full responsibility for generating. The Ostara technology has been operating at a commercial scale since May 2009 at the Clean Water Services’ Durham Advanced Wastewater Treatment facility in Tigard, Oregon. The technology is currently being tested on a pilot scale at several wastewater treatment facilities throughout North America and Europe. Ostara Nutrient Recovery Technologies Inc., founded in 2005, is a Vancouver-based company commercializing proprietary technologies that recover resources from wastewater and recycle them into valuable products. Ostara’s struvite recovery process, developed at the University of British Columbia, recovers pollutants that would otherwise be released into the environment, helps wastewater treatment plants reduce operating costs and meet environmental regulations, and provides municipalities and utilities with revenue from the sale of the recovered pollutants that are recycled into environmentally safe slow-release fertilizer, Crystal Green®. For more information: visit www.ostara.com and www.crystalgreen.com. Ostara Nutrient Recovery Technologies Inc.